A: For our Spring season, boys and girls between "League Age" 4 and 16. Players who also play high school baseball should not register for Junior Division unless they are league age 14. League Age 15 and higher will need to wait until Senior Division in May. A: Registration for Spring Ball opens in October/November. Registration opening dates will be announced and posted on our home page. A: For Spring, all divisions are $140. For Winter, all divisions are $70. A: Your Spring registration fee includes a uniform (jersey, pants, socks, belt, cap) a picture package and end of season award. You will need to supply a glove and cleats, bats are optional. Q: Is there a multiple-sibling discount? A: Multiple siblings will get an additional $5.00 discount starting with the second sibling. Q: How do I provide my child’s proof of age and proof of residence? A: Multiple verification days will be held prior to our Spring season for parents to bring in their verification documents. We strongly encourage attendance to this event. See the following for lists of acceptable documents: Proof of Age. Proof of Residence. 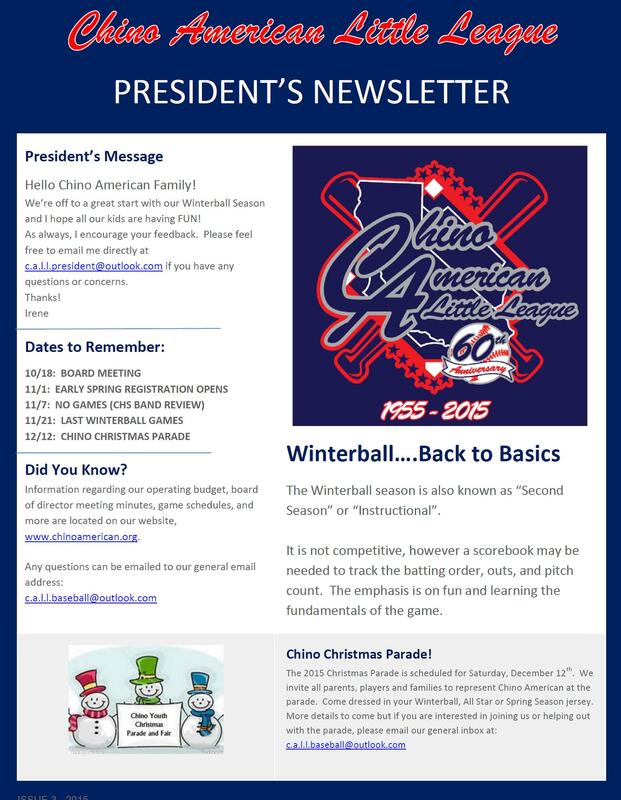 Age and residence documents are NOT required to be submitted for Winter Ball, only for our Spring season. A: Player evaluations are held for our Spring season each January for league age 8 and above. Players are assigned evaluation times and will be notified the first week of January. Players are not evaluated for the Winter season. A: For our Spring season, teams are drafted in late January and announced in early February. A: In the Spring Season games and practices will be determined by team and division once the draft takes place. A: If you are interested in being considered for a role as a manager or coach, please sign up for a volunteer role during registration and contact the division coordinator. Q: I am presented with multiple division options for registration. Which division should I choose? A: Our system presents options based on your child’s "League Age". Some of our division age groups overlap. Please select the division you would like your child to play in. For our Spring season, your child will then be evaluated (for LA 8's and above) and drafted to the division appropriate for his or her skill level. Q: I signed up but decided not to play, how can I request a refund? A: Please email us to request a refund prior to the first game of the season. We issue refund by check as our online system does not support credit/debit refunds. Once players have been drafted to a team, registration fees are non-refundable. Late Fees and Background Fees are Non-Refundable. A: For our Spring season, schedules will be distributed by your team manager in early February. A: For our spring season, Opening Day is held in late-February/early March. Games will run until late May/Early June. Post-season and All-Star play begins afterward and can continue into July. Q: Do you provide scholarships? A: Those who need to apply for financial assistance may email their request to the league president. Scholarship requirements are a Financial Hardship letter, a current progress report and a letter of recommendation from teacher or school administrator.